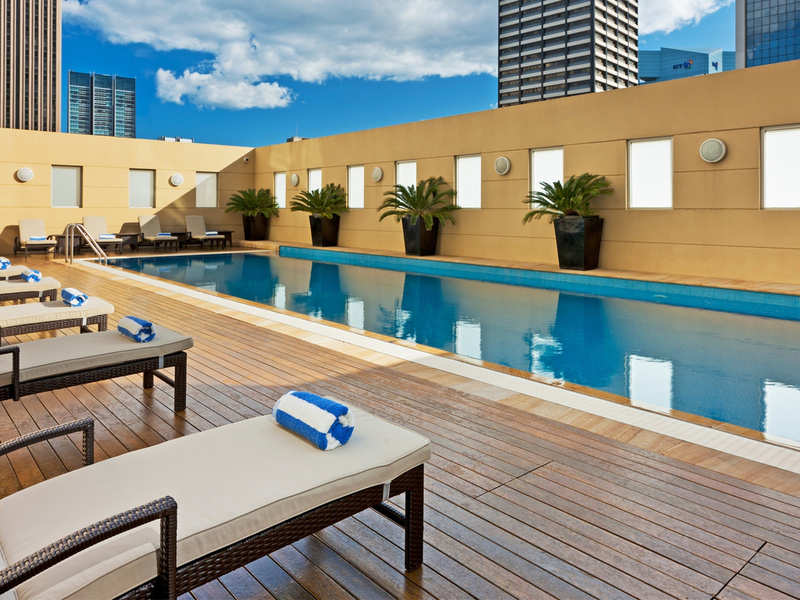 Swissotel Sydney is a deluxe five star hotel located in the heart of the city. All of Sydney's famous landmarks are within walking distance of the hotel including The Sydney Harbour Bridge, the historic Rocks precinct, Sydney Opera House and the beautiful Botanic Gardens. Experience luxury accommodation at its best in one of our 369 Sydney hotel rooms and suites reflecting a contemporary style and featuring breathtaking Sydney skyline views. CENTRALLY LOCATED - Located amongst Sydney's prime tourist shopping, entertainment and dining districts. - Central city location with underground shopping link to Town Hall train station and right next to Sydney Tower. The outdoor swimming pool will be closed for maintenance on 11 March 2019. We apologize for the inconvenience caused. Swissotel Sydney features 369 beautifully appointed rooms and suites that marry Sydney glamour with Swiss precision, offering an ideal retreat for business or leisure travellers in the heart of the central business district. Jpb Restaurant offers a range of locally sourced and seasonally inspired dishes. The menu is designed to take its diner on a culinary journey of flavour, color and texture with meals cooked from the heart and with the integrity of each ingredient in mind. A re-introduction to the classic hotel bar where impeccable service unite with modern designs, Crossroads Bar is the perfect dining venue for a post-shopping leisurely high tea, after work drinks or an early dinner before a show at the State Theatre. Ett underbart fint hotell, fräscht med bra wifi. läget är jättebra centralt i Sydney, nära till allting. Väldigt trevliga i receptionen. Otroligt sköna sängar. Bästa någonsin. Centralt läge. Nära Sydney Tower. Centralt läge. Allt fungerade väl. Rent och snyggt. Valde hotellet för att det hade pool!